Beautifully designed, incredibly robust and backed by a superb 15-year anti-rust guarantee, this maintenance-free metal shed is the perfect place to safely house your expensive tools, garden furniture or bicycles. Beautifully designed, incredibly robust and backed by a superb 15-year anti-rust guarantee, the 6x5 Yardmaster Woodview Metal Shed is the perfect place to safely house your expensive tools, garden furniture or bicycles. Coating your shed in preservative and repairing torn roof felt will be jobs from the past once you’ve purchased this maintenance-free garden shed. Built from hot-dipped galvanised steel, this superior metal shed will never warp, crack or split, even in extreme weather conditions, and is also completely impervious to damage from bugs and pests. A traditional apex roof and a gorgeous baked-on woodgrain finish ensure that this garden storage shed doesn’t just boast brawn but beauty too, whilst the 7 layers of protection eliminate any risk of corrosion and ensure the shed’s immaculate appearance will endure for many years to come. You can gain easy access to your stored items via sliding double doors, which are overlapping, include a padlock fixing (padlock not included) and are fitted with anti-tamper bolts, so rest assured that your prized possessions will be completely shielded from the elements and safe from unwanted attention. High gables make this 6x5 shed suitable for even our tallest customers, whilst ventilation along the ridge and eaves ensures optimum storage conditions. With dimensions of 199cm x 202cm x 137cm, this 6x5 shed is supplied with an anchor kit, clearly-numbered parts, an assembly manual, rust-resistant screws and UK-based telephone support to help you achieve a simple, stress-free assembly. Why choose a metal shed? At Buys Sheds Direct, we take pride in bringing you high quality sheds. That’s why we stock metal sheds from Yardmaster, Europe’s leading metal shed manufacturer. Yardmaster produce maintenance free, hot dipped galvanised steel sheds featuring Yardmaster’s trademark 7-layers of protection. The result is a construction that is 25% stronger than that of other European sheds. A brand and a shed you can rely on. These sheds have a range of excellent benefits, detailed in the images below. Please note: The Woodview, Castleton, Emerald Deluxe and Shiplap ranges feature a 15 year guarantee. All other Yardmaster models offer a 10 year guarantee. All Yardmaster metal garden sheds come complete with an anchor kit to secure your shed to a concrete or paved base and can be supplied with or without a floor (please check the individual specifications). Yardmaster is Europe's top metal shed manufacturer. Their sheds and outdoor buildings are renowned for their high quality build, impressive guarantees and maintenance free finish - just the sort of sheds we love at Buy Sheds Direct. Yardmaster sheds come in a variety of styles to suit all gardens and their features show the attention to detail you'd expect from the leading metal shed manufacturer. An anchor kit is supplied to secure your shed to a concrete or paved base. Internally mounted, overlapping double sliding doors. Ventilation along eaves and roof ridge to combat condensation. 150mm wide ridge cover aids airflow while preventing rain penetration. Spacious headroom. High gables on all apex models - up to 2.2m headroom and up to 1.8m eaves. Unlike wooden sheds, these metal sheds are completely maintenance free. Neither the weather or pests are a problem for Yardmaster’s quality build. Their advanced baked on finish looks fantastic for years with no need for repainting or rust proofing. 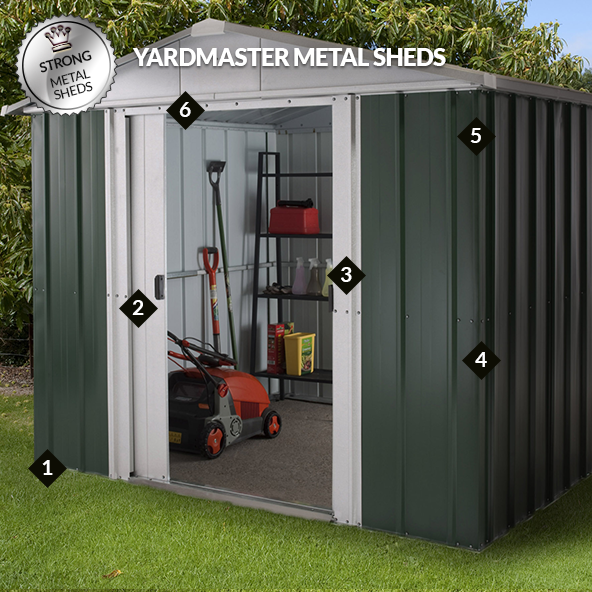 With just a helping pair of hands and Yardmaster’s illustrated manual, you can have your metal shed ready for use in approximately 3-6 hours. Should you need further assistance, Yardmaster provide local helplines.